WordCamp Portsmouth UK 2011 took place on the weekend of 16-17 July. 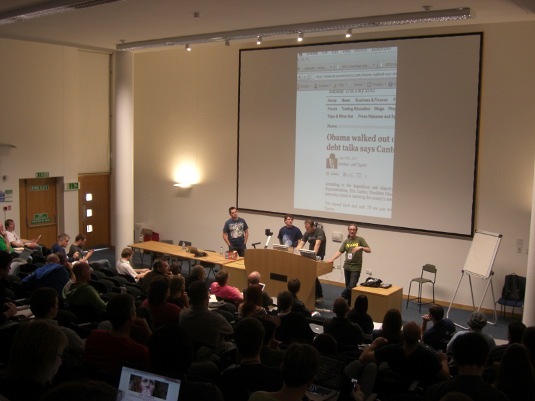 There’s plenty of reports of the proceedings on the WordCamp UK wiki. Rich Boakes who put forward this year’s winning venue bid and provided invaluable help in the organisation of the event. The University of Portsmouth for the venue. All our sponsors and microsponsors. Mike Little for the efficient processing of all the financial issues. Jonny Allbut for building the Portsmouth 2011 event site. Jonathan Harris for the event graphics and t-shirt design. The WordCamp UK Core Group. And last (but not least!) thanks to everyone who attended. The feedback was overwhelmingly positive about the event, and plenty of improvements were suggested for 2012. The Core Group has taken on board many of these suggestions, and hopes to be issuing the 2012 venue requirements in the next few weeks, against which bids for specific event locations will be invited. The decision on the venue for next year will taken by the WordCamp UK mailing list. So if you want to influence where in the UK the follow-up to the Portsmouth WordCamp takes place, subscribe to the mailing list now! please let me know if you are running a wordpress (wordcamp) event in 2012 as it looks exactly what we are looking for. Russ – Next year’s WordCamp is planned to be 14-15 July 2012.